When you first read the title of this article, you might have thought: why would anyone want to have a portable sewing machine? It’s not like you can sew on the go. Well, actually, you can, but it is not recommended to do these kinds of activities in a car, a train or in any place where you might get distracted or where the quality of your work can suffer. Sewing requires a lot of attention, that’s true, but it doesn’t mean that you have to do it in the same place at all times. Those who are already experienced sewers or quilters know that it would be nice to be able to move away from the sewing table from time to time, just for the sake of change. Others know that sometimes, they would like to take their work at home, just like a corporate employee does with its laptop. The reason why portable sewing machines exist is that everyone needs to have some freedom and flexibility. Having to uninstall a fixed sewing machine is neither pleasant, nor comfortable, which is why those who know that will be changing tables every now and then, choose to invest in portability. Buying a sewing machine is the best thing that you can do, especially if you are a creative person who likes to sew or quilt, to create new patterns on fabrics that are meant to be used for home decor or if you are a passionate DIYer. Are you looking to buy the best portable sewing machine but you don’t know which model to choose from the variety that the market has to offer? We have selected the five best-selling products available online and in store right now, highlighted their pros and cons based on personal observations and consumers’ reviews. Check out the five models below and decide which one suits your needs best. If a brand’s credibility is important for you, then nothing can beat this product that has been manufactured by Singer, one of the most renowned brands in the world. This is a heavy duty sewing machine that comes at a great price, giving its capabilities and design. The 4423 model has a metal frame that is sturdy and durable and that has the purpose to ensure the stability of the machine. Its bedplate is made of stainless steel and its design is nice and compact. There are many reasons why you will want to make this sewing machine yours. Its presser foot pressure makes sewing easy, regardless of the fabric, its built-in needle threader makes threading easier, while its strong motor helps sew 1100 stitches per minute. This portable sewing machine also has a top drop-in bobbin that is easy to insert and remove. It has 6 basic stitches, 4 stretch stitches, 12 decorative stitches and a buttonhole. Its buttonhole is fully automatic and its stitch length is adjustable. Also, its stitch width is 6mm, it has three needle positions and adjustable reverse. As expected, it has a free arm and an extra-high presser foot lifter. Thanks to its small size, it can be carried around with ease. This sewing machine can be used to sew both lightweight and thick materials, which is great for you if you work with different material types, from satin to leather. If you are looking for a Singer portable sewing machine that is even more affordable and still offers the durability that you expect from such a brand, as well as great technical specs, then you will love this model. The 1304 comes at a great price; it is lightweight and can be easily carried around thanks to its weight of only 11.5 pounds and its size of 13 x 7 x 11.5 inches. This free arm sewing machine has 6 built-in stitches, a 4-step buttonhole and a removable storage compartment that helps you store your sewing accessories. It has automatic bobbin functions, so you simply have to follow the diagram that is printed on it and the needle bar will automatically disengage. Also, it will stop turning when fully filled. The 1304 model from Singer is one of the brand’s basic models, which makes it ideal for beginners, as it is extremely simple to use and it doesn’t have too many functions that would make the whole process confusing. All of its 6 built-in stitches have pre-set stitch width and length, so you don’t have to make any additional adjustments. This product comes with an all-purpose foot and a zipper foot. Also, it has a low bar for its foot system. Its sewing speed is much lower than the previous product’s, but that one is meant to satisfy another level of experience. This machine can sew approximately 350 – 400 stitches per minute. Other features that you will love are the easy stitch selection, the free arm, the built-in reverse, the easy threading and the adjustable tension settings. If what you want is a high-quality sewing machine that is portable, durable and has an acceptable price, the XM2701 model from Brother could be the perfect match for you. This is a versatile model that can be used for a variety of sewing projects, from decorative patterns to clothing creation. If you like diversity and it is mandatory for you to have a lot of options, then you will be glad to know that this product has 27 unique built-in stitches. Also, it comes with 6 quick-change sewing feet. 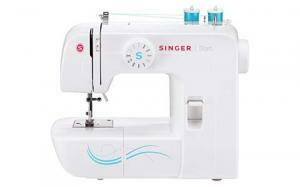 Moreover, it has a jam-resistant drop-in-top bobbin and 63 stitch functions. The easy stitch selector is easy to use and practical, while the easy threading system that comes with an automatic needle threader makes your work so much easier. If you love to sew clothing pieces together and to create your own clothing articles, then you will love its one-step buttonholer. Also, it features easy bobbin winding. Thanks to the instructional DVD that comes with in the box, you will get used with it quickly and easily. This sewing machine measures 17.8 x 7.6 x 15.1 inches and weighs 12.6 pounds. It is easy to store and transport when needed, so it might be one of the best portable sewing machines for professional use. Yet another portable sewing machine that is affordable and suitable for home use is brought to the market by Brother. The CS6000 model has a feature that none of the first three products in our list had so far and that is the wide work surface. Having this large table, you cannot only sew, but also quilt and take on more complex projects that require a larger work space. Another great thing about this model is its LCD display that shows the selected functions accurately and that helps you work more efficiently. This product is equipped with an automatic needle threader, threading diagrams and more importantly, an adjustable sewing speed control system. As for its sewing features, it is worth mentioning that it has 60 built-in sewing stitches, out of which some are decorative and 7 are different buttonhole styles. More than that, it has 9 presser feet that are meant to help you do buttonholes, overcasting, monogramming, zipping, zig-zags, blind stitch, button fitting and more. Also, an automatic needle threader is present, as well as a built-in free arm. The wide table is detachable, so you can remove it whenever you don’t need it for quilting projects. In order to offer you as much support as possible, the manufacturer has put together an instructional DVD and also offers online technical support. More than that, it backs the product with a 25-year limited warranty. The last product on our list is, of course, one of the best portable sewing machines that you can find on the market. The 9960 model by Singer is not only packed with amazing features, but it has a great design and integrates advanced technology, too. All these specs come at a higher price, so if you want a sewing machine that does it all and that is portable at the same time, you should be ready to extend your budget. This is a computerized model that has a wide selection of stitches, from basic, to stretch and decorative. Also, it has a set of fonts that can help you personalize every project. Just like any other modern sewing machine, it has an automatic needle threader. It has 5 alphanumeric fonts, 13 built-in one-step buttonhole styles, 600 built-in stitches and one-touch stitch selection that can be done easily from the front panel. The great thing about this product is that it has electronic twin needle settings. Also, it features an easy-to-load top drop-in bobbin system. It can be used for sewing, quilting and embroidery creation thanks to its extension table that offers users a large working surface. It has automatic tension, automatic bobbin winding, an automatic locking stitch function, automatic reverse and an electronic auto-pilot that most users love. There’s more to it: it has mirror imaging and elongation functions, automatic presser foot pressure control and power control. 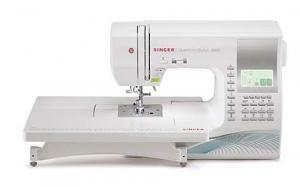 The front panel of this sewing machine includes a large back-lit LCD screen that allows you to adjust the brightness. These are just a few of the reasons why you will simply love this incredibly efficient sewing machine that is backed by a 25-year warranty. When the time comes for you to buy a sewing machine, portability is the most important element that you should take into consideration. Being able to move from one corner of the house or workshop to another might be good for you. More than that, if you relocate a lot and you like to take your hobby with you, a portable model that is easy to setup, pack and unpack is exactly what you need. Before making a decision, make sure that you analyze your needs and that you know exactly what the specifications of your new device should be. How much you invest in the best machine depends only on how advanced and large you want it to be. Think about the stitch patterns, functions and accessories that you need, about size of the work surface, the brand and the quality of the materials that you want. Also, consider the adjustability of the models that you like, the design and the attachments that it has. Then, set a budget and see which of the above five products is closer to your preferences.